The current mayor of Westland is William (Bill) Wild. During his first term as President of the Westland City Council, Mr. Wild was appointed as mayor after Mayor Sandra A. Cicirelli was elected as judge of the 18th District Court in November 2006. Mr. Wild took office in January 2007 and continues to serve as mayor. In the judicial branch of government, Sandra A. Ference Cicirelli and Mark A. McConnell. Cicirelli have served all three branches of government in the City of Westland. The legislative body of Westland is the City Council, which contains seven members. The current President of the City Council is James Godbout. He was re-elected in 2015 and has spent almost 20 years on City Council. In addition to Council President Godbout, other Council members are Council President Pro-Tem Peter Herzberg, Elbert (Bill) Johnson, Adam Hammons, Jim Hart, Michael Londeau, and Tasha Green. Both Jim Hart, and Michael Londeau, have been very active in the city of Westland for many years, serving on boards and commissions up until their election in 2017. Both Londeau and Hart are also members of the Westland Area Jaycees. Councilman Peter Herzberg, elected in 2015, is the youngest elected Council person in the history of the City of Westland. At 25 years old, Herzberg has already spent countless years volunteering for community organizations and working as a public servant. Richard Leblanc was elected as City Clerk in the November 2015 election. He has experience as a former City Council Member in Westland, as well as time in the State House of Representatives and the Wayne County Commission. Tasha Green was one of four winners in the November 2017 election for Westland City Council, becoming the first African American woman to be elected to Westland City Council. During the election, Green stated that one of her top agenda items was to use her business experience to ensure the City of Westland's financial picture is made healthier. The Norwayne subdivision is one of the oldest areas of the city, having existed for over 65 years. The area was built immediately after World War II to provide temporary housing for returning soldiers who worked in nearby factories. In late 2009 the City of Westland received $2.061 million to radically clean up, restore and rehabilitate this historic district. This is through Stimulus/Recovery funds and was allocated under the NSP - Neighborhood Stabilization Program of 2008. Please see the City of Westland Development for additional details. This project is expected to be completed by 2013 and was highlighted in the 2009 State of the City mayoral address. By 1960, Nankin's population had increased to 70,000, giving the area the distinction of being the world's largest township. During the early 1960s, the city of Livonia wanted to annex the part of Nankin in which a large shopping mall, Westland Shopping Center, was to be built. The shopping center eventually opened in 1965, joining Northland and Eastland malls in Southfield and Harper Woods, respectively. In reaction to Livonia's annexation attempts, the people of Nankin voted on May 16, 1966, to change the remainder of the township to the City of Westland. At that time, it was the fourth largest city in Wayne County. Portions of Westland that had been in the Taylor School District prior to the 2013 dissolution of the Inkster School District are assigned to Taylor Parks Elementary School, Hoover Middle School, and Harry S. Truman High School in Taylor. Portions in Livonia School District are assigned to Hayes (in Westland), Rosedale, Garfield, and Cleveland K-4 elementary schools. 5-6 elementary schools include Johnson Upper Elementary School (in Westland) and Cooper Upper Elementary School (in Westland). Livonia SD middle schools serving Westland include Frost and Emerson. Livonia SD high schools serving Westland include Churchill High School and Franklin High School. There is a portion of southeastern Westland that is currently divided between Romulus Community Schools and the Taylor School District that was previously assigned to the Inkster School District. Romulus Senior High School is the assigned high school for Romulus students. Students in the Inkster zone previously attended Inkster High School. There is a charter school in Westland, Universal Learning Academy. According to the United States Census Bureau, the city has a total area of 20.45 square miles (52.97 km2), of which 20.43 square miles (52.91 km2) is land and 0.02 square miles (0.05 km2) is water. As of the census of 2010, there were 84,094 people, 35,886 households, and 21,289 families residing in the city. The population density was 4,116.2 inhabitants per square mile (1,589.3/km2). There were 39,201 housing units at an average density of 1,918.8 per square mile (740.9/km2). The racial makeup of the city was 75.8% White, 17.2% African American, 0.5% Native American, 3.0% Asian, 1.1% from other races, and 2.4% from two or more races. Hispanic or Latino of any race were 3.8% of the population. There were 35,886 households of which 29.6% had children under the age of 18 living with them, 37.5% were married couples living together, 16.4% had a female householder with no husband present, 5.4% had a male householder with no wife present, and 40.7% were non-families. 34.3% of all households were made up of individuals and 12.5% had someone living alone who was 65 years of age or older. The average household size was 2.31 and the average family size was 2.98. The median age in the city was 38.3 years. 22.1% of residents were under the age of 18; 9.5% were between the ages of 18 and 24; 27.7% were from 25 to 44; 26.6% were from 45 to 64; and 14% were 65 years of age or older. The gender makeup of the city was 47.5% male and 52.5% female. As of the census of 2000, there were 86,602 people, 36,533 households, and 22,248 families residing in the city. The population density was 4,234.9 per square mile (1,635.1/km²). There were 38,077 housing units at an average density of 1,862.0 per square mile (718.9/km²). The racial makeup of the city was 87.21% White, 6.77% African American, 0.46% Native American, 2.81% Asian, 0.03% Pacific Islander, 0.67% from other races, and 2.04% from two or more races. Hispanic or Latino of any race were 2.47% of the population. There were 36,533 households out of which 28.6% had children under the age of 18 living with them, 44.4% were married couples living together, 12.1% had a female householder with no husband present, and 39.1% were non-families. 32.6% of all households were made up of individuals and 11.3% had someone living alone who was 65 years of age or older. The average household size was 2.34 and the average family size was 3.00. In the city, the population was spread out with 23.3% under the age of 18, 9.0% from 18 to 24, 33.9% from 25 to 44, 20.6% from 45 to 64, and 13.2% who were 65 years of age or older. The median age was 35 years. For every 100 females, there were 92.6 males. For every 100 females age 18 and over, there were 89.6 males. The median income for a household in the city was $46,308, and the median income for a family was $55,323. Males had a median income of $45,111 versus $30,143 for females. The per capita income for the city was $22,615. About 4.7% of families and 6.8% of the population were below the poverty line, including 7.6% of those under age 18 and 6.9% of those age 65 or over. The City is known for having an abundance of parks. Hines Park (wayne county parks) is located in the northern region of Westland. Residents along this corridor enjoy seeing deer, fox and hummingbirds all year long as well as easy access to the bike paths of Hines Park. Westland also has numerous City owned parks throughout many of the neighborhoods. ^ "Race, Hispanic or Latino, Age, and Housing Occupancy: 2010 Census Redistricting Data (Public Law 94-171) Summary File (QT-PL), Westland city, Michigan". U.S. Census Bureau, American FactFinder 2. Retrieved September 8, 2011. ^ "Elementary School Boundary Map." Taylor School District. Retrieved on April 20, 2014. ^ "Middle School Boundary Map." Taylor School District. Retrieved on April 20, 2014. ^ "High School Boundary Map." Taylor School District. Retrieved on April 20, 2014. ^ a b "Official Zoning Map." City of Westland. September 2014. Retrieved on April 21, 2016. ^ "K-4 Elementary areas." Livonia School District. Retrieved on April 21, 2016. ^ "Upper elementary areas, middle school areas, and high school areas." Livonia School District. Retrieved on April 21, 2016. ^ "NEW SCHOOL DISTRICT BOUNDARIES FOR INKSTER RESIDENTS" (Map). Wayne RESA. Retrieved on April 20, 2014. ^ "Street Jurisdiction Map" (Archive) City of Westland. Retrieved on April 20, 2014. ^ Clemens, Paul. "Breakdown ‘Detroit: An American Autopsy,’ by Charlie LeDuff." The New York Times. February 22, 2013. Retrieved on July 12, 2014. 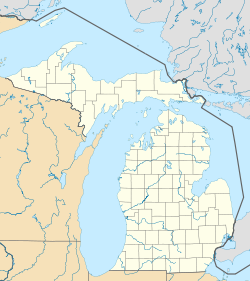 Wikimedia Commons has media related to Westland, Michigan.